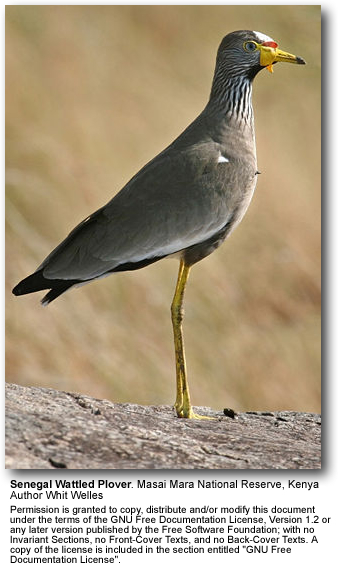 The Senegal Wattled Plover - also known as African Wattled Lapwing (Vanellus senegallus) - is a large lapwing, a group of largish waders in the family Charadriidae. It is a resident breeder in most of sub-Saharan Africa outside the rainforests, although it has seasonal movements. This species is a common breeder in wet lowland habitats, especially damp grassland. These are conspicuous and unmistakable birds. They are large brown waders with a black crown, white forehead and large yellow facial wattles. The tail is white, tipped black and the long legs are yellow . In flight, Senegal Wattled Plover's upperwings have black flight feathers and brown coverts separated by a white bar. The underwings are white with black flight feathers. It often feeds in drier habitats, such as golf courses, picking insects and other invertebrates from the ground. It lays three or four eggs on a ground scrape. 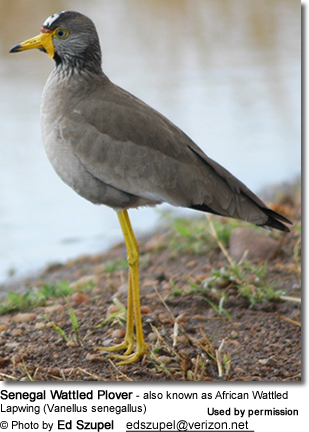 Senegal Wattled Plover has a loud peep-peep call. The Senegal Wattled Plover is one of the species to which the Agreement on the Conservation of African-Eurasian Migratory Waterbirds (AEWA) applies.